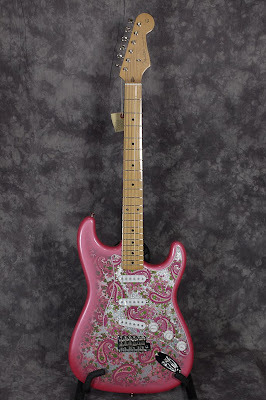 Martin Music Memphis is currently listing this brand new limited run pink paisley RI Stratocaster at $999.99- Buy It Now, shipping included. How do they do it? It's an MIJ Fender, that's how. If you're cool without the "made in USA", these Japanese Fenders are top quality guitars. And, if you've always wanted a paisley, but couldn't come up with the $$$, this could be your opportunity. Dave, are you reading this? Oh yeah, it's paisley on the back too.